Step One: Cut your sausage into bite size pieces; saute until thoroughly cooked. Want to make quick work of this - use a kitchen shears to cut the sausage! Works great! Whats a merguez sausage? 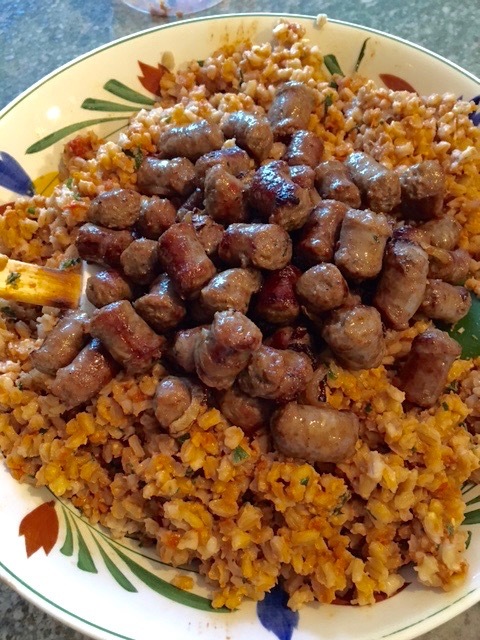 It's a fresh sausage originating from North Africa made from lamb usually, but beef is also used. The heady flavors come from a mix of forward spices including coriander, cumin, paprika and cayenne. This sausage brings a lot of flavor to the dish and isn't too spicy. Step Two: Steam your greens, just a light steam, till they turn bright green. Over cooking kills nutrients. Step Three: While everything is cooking combine your cooked grain with a container of pesto from Sorelle Cucina - use the entire container. Toss to incorporate. The flavors compliment the merguez sausage beautifully. Step 4: Using a slotted spoon to leave the fat behind, add your cooked sausage to the grain; then add your steamed greens. Combine thoroughly. Step 5: Taste to adjust the seasoning. Add salt and pepper as desired. A drizzle of balsamic vinegar adds a nice bright note. And a splash of olive oil makes it shine! Enjoy!